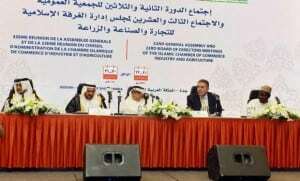 JEDDAH: The Islamic Chamber of Commerce, Industry and Agriculture (ICCIA) stressed the need to strengthen economy of the 57 Muslim countries, at a meeting of the General Assembly and the Board of Directors of the ICCIA. UNITY STRESSED: The Islamic Chamber of Commerce, Industry and Agriculture (ICCIA) highlighted and emphasized on strengthening the economy of the 57 Islamic states at a meeting of the general assembly and the board of directors of the ICCIA on Saturday. The session was attended by Organization of Islamic Cooperation (OIC) Secretary General Iyad Madani, Islamic Chamber of Commerce President Saleh Kamel, besides several representatives from ICCIA and Muslim states. Saleh Kamel said there is need to work together to develop economies of the Islamic states at all levels. He recalled the vital role that King Faisal bin Abdul Aziz played in creating OIC and his call for the establishment of an Islamic market and the Jeddah Islamic Port. While lauding the role of King Khalid bin Abdulaziz also in integrating the Arab economic unity, Kamel referred to the current role being played by Custodian of the Two Holy Mosques King Salman, who he said seeks to strengthen this cooperation for the development of individual and common economies. While the Muslim world facing terror scourge, the OIC, he saids, stands by the Muslim communities to restore the prestige and power of the Islamic nations. He said the ICCIA council has decided to establish the Halal Center in Qatar, which Sheikh Khalifa Al-Thani, chairman of the Chamber of Commerce and Industry in Qatar has given consent to. Iyad Madani lauded the ICCIA’s role in highlighting plight of Muslims world’s economy and for its help in enhancing trade and economy. The OIC is playing its role in strengthening the economic ties between Islamic countries and is working to promote investment and attract foreign direct investment, he said. Madani noted total value of OIC’s trade amounted to a cumulative $25 billion in 2015. He said the ICCIA is a pioneer in the field of strengthening the role of the Islamic private sector in achieving economic transformations, stressing the importance of business owner’s contributions to the implementation of OIC projects in different Member States, especially those which are suffering from political and social crises.